It’s been a rough winter for Kansas City, which means it’s been even rougher on our seniors—most of whom identify as low-income. So far this season, we’ve had a record-breaking eleven snow days—that’s eleven days we’ve had to close the Senior Center because it’s been too dangerous for clients to be out and about. Each snow means that our seniors have to go without a much-needed hot meal along with a warm place to socialize and stay active. For the Senior Center, it means continued operational costs with no reimbursement from our primary funder, Mid-America Regional Council. Each closure sets our budget back an estimated $4,000. To help make up the difference—and as a way to give something back to our amazingly supportive community—The Don Bosco Centers is raffling this extremely valuable donation from a long-time Friend of Don Bosco. We hope you’ll show your love for our clients and our favorite football team by purchasing chances to win. Good luck! Don’t miss out on your chance to own this piece of Kansas City football history! 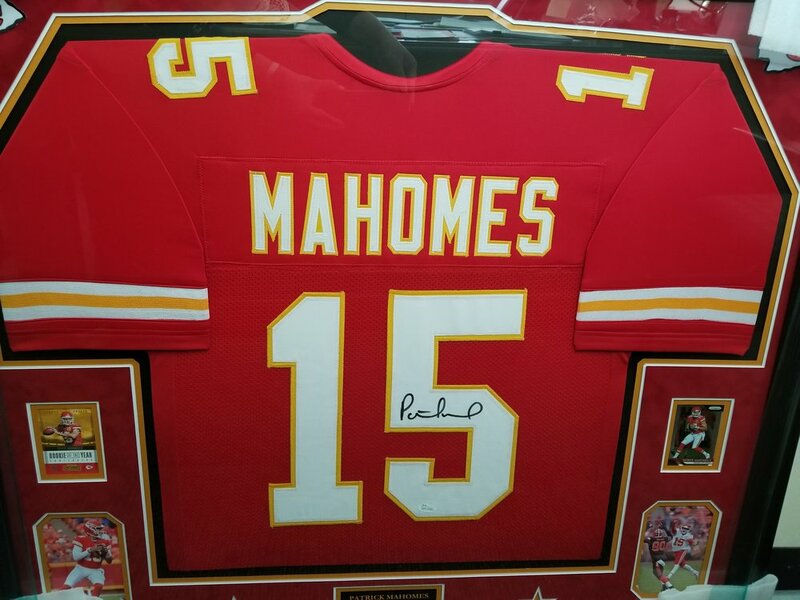 This officially-licensed Mahomes jersey, signed by Kansas City’s favorite quarterback and handsomely framed, can be yours if you hold the lucky ticket! Only 1,000 tickets are available for purchase, and the drawing will be held once we sell them all, so get your tickets soon! Winner need not be present to win. The Runner-Up Prize is a wining and dining extravaganza for 4 at Garozzo’s Ristorante—a $500 value! Thanks to 41 Action News, KSHB-TV for helping us spread the word about the raffle! Get their full coverage here. 1. Entry to the Raffle is limited to persons 18 years of age or older. At any time, entrants may be asked to provide The Don Bosco Centers with proof of age and/or identity. 2. Employees of The Don Bosco Centers shall not be eligible to enter the Raffle. 3. The grand prize for the Raffle shall be one (1) Patrick Mahomes II jersey autographed by Patrick Mahomes II. The runner-up prize shall be dinner and drinks for four (4) at Garozzo’s (a $500 value). 4. By entering the Raffle, each entrant unreservedly agrees to these terms and conditions which govern the Raffle and the awarding of the Prize. 5. The Raffle drawing shall take place on August 1, 2019, or after one thousand (1,000) tickets have been sold, whichever comes first. 6. Raffle tickets shall cost twenty-five dollars ($25) each, or five (5) tickets for one hundred dollars ($100). 7. In order to enter the Raffle, entrants must provide their name, address, telephone number, and email address. 8. Winner specifically acknowledges that winner shall be responsible for the payment of all tax, title fees, license fees, insurance requirements and other charges as may be required under any law, ordinance, statute, regulation, or otherwise. 9. One winner shall be drawn randomly and The Don Bosco Centers shall notify winner of the winning via mail and telephone within ten (10) business days of the Raffle. The winner will also be named on The Don Bosco Center’s website and social media. Winner need not be present to win. 10. If the prize is not claimed within twenty (20) business days of the Raffle drawing, a new winner shall be drawn. 11. The Don Bosco Centers decision is final with respect to all matters relating to awarding of the Prize and shall not be subject to review or appeal by any entrant or by any third party. 12. Your participation in the Raffle is deemed your agreement that The Don Bosco Centers may use your name, likeness, or image for promotional and marketing purposes without the requirement for any payment to you and you hereby grant The Don Bosco Centers the right to do the same and expressly waive any claims against The Don Bosco Centers in this regard. 13. The Prize is neither transferable nor exchangeable and cannot be exchanged for money or money’s worth. 14. By entering the Raffle each entrant agrees to release, discharge, and hold harmless The Don Bosco Centers, its legal representatives, affiliates, subsidiaries, agencies, and their respective officers, directors, employees and agents from any damages whatsoever suffered, sustained or allegedly sustained in connection the Raffle or the acceptance of the Prize. 15. The winning entrant shall be solely responsible for any taxes levied in relation to the delivery or receipt of the Prize. 16. The Don Bosco Centers reserves the right to alter these terms and conditions at any time and in its sole discretion. 17. The Don Bosco Centers reserves the right, at any time, to cancel, modify, or suspend the Raffle if, in its sole judgment, the Raffle is not capable of being conducted as specified. 18. These terms and conditions and any matters relating hereto shall be governed by and construed in accordance with the laws of Missouri and jurisdiction over any and all disputes shall be exclusive to the state and federal courts in Kansas City, Missouri.